Come join us for a great day out on our local wrecks and reefs. You must be an Advanced Diver if we go in depths of 100 plus feet. Rates include fishing license and lobster permit. Rates do not include dive gear or tanks. If gear is needed, please contact the local dive shops. All dive trips are subject to availability. The captain reserves the right to cancel the trip or change dive sites due to sea conditions. One day trips will accommodate up to 12 divers. We must have a minimum of 8 divers for all trips. Spearfishing is permitted. We provide snacks and beverages. A Dive Master is on board for all our dive trips. 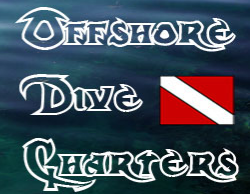 Dive masters work for gratuities, which are not included in the price.